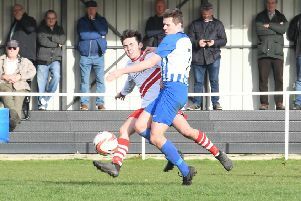 Skegness Town won their bottom-of-the-table clash at Harworth Colliery thanks to two late goals from James Wroot and Will Britton. Meanwhile, a first-half penalty save by James Lambley set the tone. What will have pleased the Lilywhites, almost as much as the three points gained, was the first away clean sheet of the season. Indeed, the seasiders have only had two shut outs all season, the last one being at home to basement side FC Bolsover back in August. But it could have been so different. The travelling fans among the 92 spectators - the highest in the Division on Saturday - thought the worst when the Colliery were awarded a penalty after just 11 minutes. The home side had missed a spot kick the previous week and so Sam Foulds was given the responsibility. To the delight of the seasiders, Lambley pulled off a great save to lift their spirits. With centre back Andy Parish back in the side, the visitors continued to battle to secure a quickfire double, having beaten the Colliery at the Vertigo Stadium by the odd goal in three two weeks before. They worked hard to get men behind the ball and denied the home side any goalscoring opportunities. Their disciplined display saw them reach the half-way mark on level terms and they produced more of the same after the break. With nine minutes left, Wroot broke the deadlock for his new club when he slotted the ball home from six yards. The goal opened the game up and Harworth went in search of an equaliser. But it was substitute Britton who had the final say, firing home Town’s second goal in the last minute. TOWN: J. Lambley, Sibbick, Morrall, Parish, L. Lambley, Forth, Smith, Ford, Stevens, Robinson, Wroot, Britton, Warren, Evison. On Saturday Skegness Town entertain mid-table AFC Emley in the league at the Vertigo Stadium (KO 3pm).